Ginger|Lemon Hairspace 1060 Vienna - new guys in town! Our very own hairdressing salon located in Gumpendorfer Straße 147, 1060 Wien opened it’s doors on Valentine’s day 2019. On 150m² we are welcoming our clients in Viennas most colourful salon. A lounge-y waiting area, a very own shop where you can browse through our handpicked selection of hairdressing products, a colouring and cutting area apart from each other and a private washing room. We are Vienna's place to be for anything hair-related! Specialised in Couture Colours ranging from the most bright vivids to custom blondes, pastels and colour trends from all over the world. We offer fantastic Cuts and amazing Stylings. With partners such as PulpRiot, OLAPLEX; Maria Nila and Evo Haircare we can create anything that is on your mind. Have a look at our Services and Prices on our new Website - you can also secure your spot via the online booking tool there directly. Ginger|Lemon are Austria’s most nominated hairsalon for the Austrian Hairdressing Awards AHDA 2019!!!! No other salon has been able to be nominated seven times for the most prestigious prize in the hairdressing scene this year. Still not able to fully realise what we have achieved already we are looking forward to the Award’s night in April. We would be super happy if you had a look at our website GingerLemon Hairspace, browsed our Social Channels like Facebook and Instagram and of course dropped by to say “hi” in person! Can’t wait for this new journey of ours as salon owners, employers, trainers and artists. Last weekend we went to Paris with the Pulp Riot Intl. team for the MCB Creations and Trends show. Not only did we showcase and introduce all new products that are available in Europe from now on such as the “BlondeAF” lightener, clay lightener, 6 new highspeed toners and the “Neon Electrics”, we’ve also had time to have a look around the exhibition a little. MCB has changed the event into a collection in live, stage performance and artistic shows with French and international professionnals who give their view of haidressing and make-up. A schedule of unique shows on a great stage in Paris with over 3000 seats included the Hairworld 2018 competition. The weekend after - so last weekend - we were off to Mannheim to train the Newflag Educators on the new Clay Lighteners, Blond AF and Speed Toners. At the stunning Bloom’s location the two days training everybody met to be trained by Rita & me about the new products. The huge team of educators came from different countries like the Netherlands, Switzerland, different parts of Germany and Austria... It was great to see fellow artists and colleagues such as John Breitenbach, DC Shampoo & Dirk Schütt, Steffi & Lea from New Flag, Svenja Reichert, Christina Metz, Matthias Herzberg and many many more again. There is way more in the planning for the upcoming months - so stay excited for the upcoming colourful events. March has been an insanely crazy month for us!!! One month - so many countries! If you followed us on Instagram you have seen a lot of behind the scenes and work+travel impressions throughout the tour via Instastories! We met in Düsseldorf, for TopHair Messe 2018, where we performed on the mainstage with the USA-RiotSquad and had some demos at the NewFlag booth. From Cosmoprof Bologna, to Prague on 21st of March, Paris 23rd of March, Vienna on the 25th to a showcase in Delft on the 27th and a final show in Amsterdam on the 28th of March. Every location was unique and fit the PulpRiot ID perfectly. Prague and Paris hosted us in stunning night clubs, in Vienna we were showcasing in Palais Wertheim and in the Netherlands we were overlooking whole Amsterdam from the 16th floor of the A'Dam Toren. We were given the total creative freedom to create anything in our minds for the showcases. So we created unconventional and commercial looks, crazy colour combinations, modern cut and colour-techniques and different stylings. Thanks to all our amazing models for their open-mindedness and trust! Proud, exhausted and inspired we left the tour for a few nights at home to rest and focus on new upcoming projects. The Riot has just started - there will be a lot more coming up. Our new collection "Deep Dream" is inspired by an artificial intelligence also featured as „the dreaming of computers“ in the media. The outcomes of those programs are disturbing images resembling psychedelic hallucinations. Intermediate worlds and parallel realities in which reality and free association mingle. Hyperrealistic colour explostions of an unfamiliar level of details are yet fascinatingly beautiful as well as bizarre to look at. The images are more than just aesthetically unsettling computer art – it is the first time, that the public can watch computers getting creative, generating works that without a computer could not exist. We are always honored and proud to see that our collections get accepted so well by international media. Thanks to our whole team for shared effort! For more backstage shots, publications, behind the scenes and so on we would love you to follow us on Instagram. 2018 has started with a big bang for us! Sebastian's what's next awards !!!! Together with Yohann Jouvanceau from France, Harri Ìékerberg from Finland, Brodie-Lee Stubbins from Australia and Rosallie Asmar from Sweden we will be at the Finals in Los Angeles on the 28th of February!!! There will be a LIVESTREAM at 8:30 pm PST/February 25 at 4:30 am UTC. We will keep you posted about this! Not only have we moved our base to a different country (again) - we were also out and about non-stop. After last Season in Milan we have continued our session work backstage at Paris Fashion Week S/S 2018 together with the Mad Lions Artist Team and Show Division. Furthermore we joined the Hair On Stage Amsterdam 2017 Show by DAVINES and enjoyed shows by the one and only Angelo Seminara as well as presentations by Huub Eyesink, Jesus Olivier, Carlton Hair SA and Jani Beemster. Few days after that we already headed to Nürnberg in Germany to present 6 looks for gfh-Gesellschaft für Haarästhetik. 3 of the 5 Looks are a teaser to our new collection called "DEEP DREAM" and the other 3 are from our Avant Garde collection. The whole Deep Dream set will be shot coming Sunday with a top photographer, make-up artist, fashion styling and set of models - so stay put a little longer - we won't keep it a secret for too long. At this point we want to give a big shout-out to our partner gfh for the high quality wigs,extensions and giving us the opportunity to present our collection at the event, Petra Hützen from PM-Agency for her support and presentation, our beautiful models and the fantastic audience from several countries! Not to forget our photgrapher Matthias Merz: Thank you for the images! After judging the creative contest at the event and enjoying the aftershow party and dinner we arrived back at home in our Atelier to work on the last bits before the shooting. Our new collection has finally been launched: EARTHLINGS have arrived with a big bang. Some of you may have already seen some pictures of the collection on our Instagram page or on Facebook. Up until now, the collection has been printed in several hair magazines around the globe such as Friseurwelt (above), Tribu-Te, Tophair DE (left), Estetica worldwide (!) and been shared on several online mediums. WieWatHaar has published a beautiful blog about the collection, and we have been featured online by Estetica NL with it too. The collection was shot by amazing photographer Felix Rachor. More publications such as Hair's How, Tophair NL, and several other print magazines will follow. Our long awaited coverstory for L'Officiél Indonesia is finally out! We are very proud to present the result, that's why we have decided to dedicate the whole blogpost to the publication. 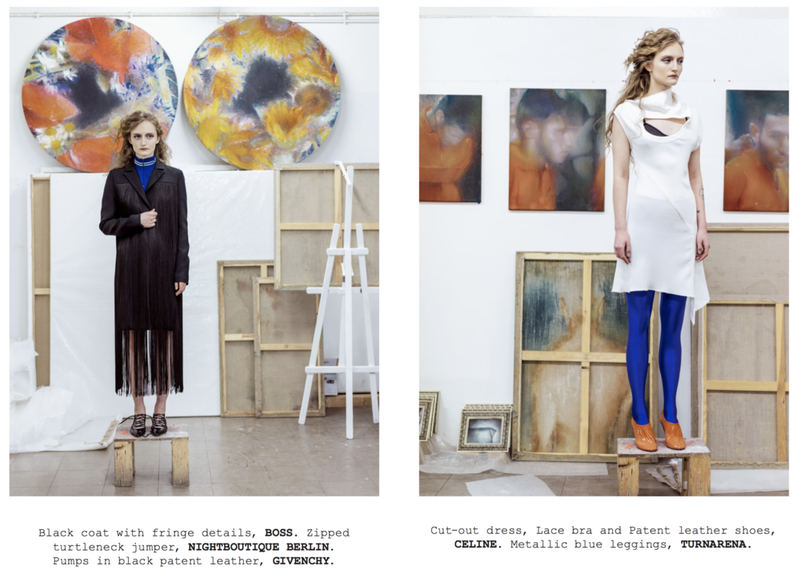 In total we got a coverage of 10 pages of our editorial "BRUTAL LOVE" shot and directed in Berlin. Some of the wardrobe styling pieces included Givenchy, Bottega Veneta, Vivienne Westwood, Céline and Gucci among others. ... since our last blogpost about Milan Fashion Week. Shortly after returning home we shot the new collection of the designer label Belle Sauvage together with photographer Daniel Peace for VOGUE UK and Shanghai Fashion Week 2017. The whole collection can be viewed here. After that we left Berlin again for the TopHair and Beauty Messe in Düsseldorf. As every year were really busy there with a tight schedule of business meetings. We will talk about the great outcomes soon - until now the plans still have to stay under wrap. Lucky us, we still had time to socialize with friends and partners from the Netherlands, Austria and Germany and watch a few shows in between. We finally got to see the Barber Show of Schorem from Rotterdam and supported colleagues for the show of the New Flag education team. Europe's biggest fare for wigs, extensions and accessoires in Fulda, Germany. There we gave 2 seminars and presented a part our new wig-collection with 3 models on the runway. It was an honour to be part of the event and represent our partner gfh Gesellschaft für Haarästhetik on stage during the show and seminars. The next chance to catch GFH and DVT together will be in October at the GFH event in Nürnberg - you can still join the event! Already less than a week later the wig collection was shot- the results will be shared as soon as they are out in print! Milan Fashion Week A/W Season 2017 was a blast! Hereby I wanted to thank all my clients, bookers, Artist Mmts., colleagues, friends and supporters to have made it this good. The big roar definitely goes to Mad Lions & Show Division. 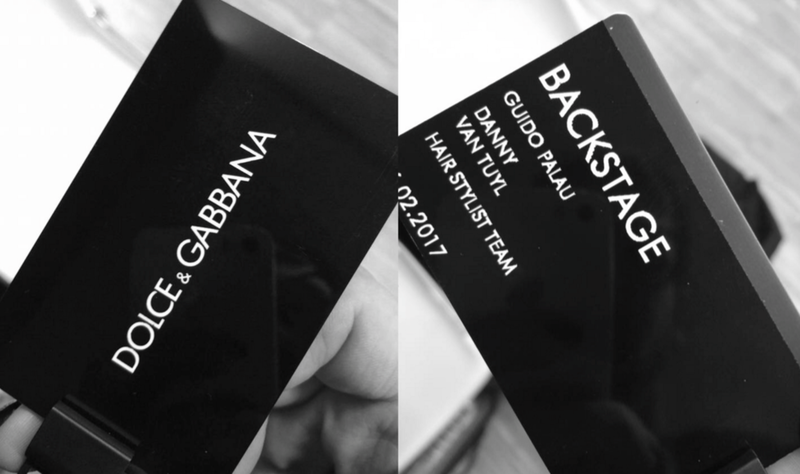 I especially loved the GUCCI & Versace Show - however what really stayed in my mind was doing hair for the Dolce&Gabbana A/W2017 show. Domenico Dolce und Stefano Gabbana sent out famous influencers in between normal models such as: Caro Daur, Aimee Song or Neels Visser. Also Pamela Anderson's son Dylan Jagger Lee, Sofia Richie, Jude Law's son Rafferty Law and Noel Gallaghers daughter Anaïs Gallagher presented the new collection. I am extremely proud to have been part of a super successful Milan Fashion Week 2017 and can't wait to be part of Paris & London Fashion Week this Fall. We are proud to announce that we have joined "MAD LIONS" based in Vienna, Austria and are now agency-represented as international hair stylist available worldwide! Our portfolio, Female as well as the Grooming porfolio and reference list can be viewed H E R E.
We will be kicking-off the Fashion Week Season in Milan with a lot of beloved colleagues and can't wait to share what else we have on our list with you all soon! Jaqueline described her impression and experience of sitting in the chair in front of me on her blog. In the 4 hours the procedure took we had a great time. I really enjoyed talking to Mikuta. "I’m super happy with the result, exactly how I wanted! I’m not always happy with the results after hair dressers because it just ended up so different from what I wanted, but this time it’s perfect :)"
I am glad to hear that she is so happy and hope you enjoy her new hair as much as I do! Thanks for trusting in me! Oh gosh - we thought we would be better at updating our blog section, but apparently we were wrong. A LOT! Quite some stuff would have probably been interesting to write about but we just didn't find the time... Sorry! We had a lot of shootings since then of which some have been published in different magazines already and some are still under wrap and about to come out within the next couple of months. We shot 4 collections for the German Hairdressing Awards 2017. This is the first time we are competing in Germany - so we are more curious than ever to find out about the nominations end September/beginning of October '16. On Monday the 5th of September we will give a full day training that is separated in a "Look&Learn" and a "Hands-On"-session. For more info and to sign up check out MW Hair& Beauty's website. Hope to see a lot of familiar faces there! Keep you posted - this time for real! From the 5th till the 6th of March 2016 artists from all over the globe met up for TOPHAIR International in the Messezentrum in Düsseldorf. - and we were in the middle of it. Thanks TOPHAIR for inviting us and making this last minute trip so successful! It was another year of a wide range of exhibitors worldwide reaching from well known brands such as OlALPLEX, WELLA etc. to small brands that came from Asia, the US and so on. Networking & talking to new people and brands and watching some of the shows. One of the highlights of TOPHAIR international 2016 was - as expected- the OLAPLEX show featuring Guy Tang. Everyone seemed that this show was one of the main reasons for coming. And: It was worth it. Guy is a great stage performer and was able to explain the visitors new techniques and up and coming trends. Another big surprise was David Cameron with his Modern Vintage show. Not for the show itself, but because he was able to present the whole program in a very entertaining German-English Mix. For a little demo of what it sounded like you can check our Instagram @dvthandcraftedhair. On the second day we watched the show of Robert Cromeans as a part of the Paul Mitchell show. He is an artist with hair and showing people a different approach. We were able to connect with a lot of inspiring artists and people and can't wait to keep you updated about our next projects. Because we didn't get the time to be online that much you already missed a shooting project in Austria and another one is coming up in less than 10 days. After rounding up 2015 with a big bang we are back with the first of our personal concepts: NEONPOP. This one is very close to our heart because we put so much blood, sweat and beers in it. Nights of brainstorming, preparations, looking for the right designers and models to create the look of NEONPOP. Together with the dreamteam consisting of Robert Pichler (photography) and Nadja Hluchovsky (make-up) we were able to bring the images that were in our heads to life in Vienna. Danny already prepared the wigs, cuts and styles in busy weeks before christmas and just had to finish off the look on set. Lizzy completed it with custom styling for the collection gathered together from several young and upcoming designers in Germany. We shot a total of 8 looks with 4 models in one day just before heading back to Berlin. "WE ARE INSPIRED BY RISK. STARTING SOMETHING WE HAVE NO IDEA HOW TO FINISH. HEADING FOR SOMETHING UNKNOWN. ANYTHING THAT HAS POTENTIAL FOR FAILURE – BUT NOT TOTAL DISASTER- GETS OUR HEART AND CREATIVITY PUMPING. “NEONPOP” IS A CLASH BETWEEN CULTURES. POP ART MIXED WITH JAPANESE STREET FASHION SCENES LIKE “DOLLY KEI” AND “DECORA”. BY OUR UNORTHODOX APPROACH OF HAIR AND TEXTILES WE BROUGHT A BRIGHT EXPLOSION OF COLOURS, TEXTURES AND MATERIALS TO LIFE. WE CREATED A LOOK OF INDIVIDUALS URGING FOR SELF EXPRESSION AND SHARING THEIR OWN PERSPECTIVE OF CLASSIC BEAUTY IN A MODERN SOCIETY." - © DVT Handcrafted Hair. special thanks to Ladieshair, Stella Models Vienna, MIX ModelManagement and EXIT Models Slovakia. Welcome back to our second blog and thank you so much for all your positive feedback regarding our new website! We love the fact that people respond even more positive to it than expected! Some of you may have followed our Olaplex Roadshow through 3 countries (Germany, Austria and Switzerland) on Instagram in late 2015. Back then we were stopping in 13 big cites to showcase the endless abilities with Olaplex. Homeward bound - straight to Amsterdam. Monday, 7th of March in de Hallen in Amsterdam. - more dates will follow. We hope to see some familiar faces back in the Netherlands! Well, at least we reserved the spot and could print our business cards, right? Anyways; have got a grip on ourselves and given us a deadline between shootings and other projects - finish that goddamn website before the 5th of February. It took us some sleepless nights and still we will finetune some bits and bobs but it is good enough to unleash this monster! First of all - because we felt that we needed one. On the other hand it is a great way to keep friends, family and clients up to date to our busy lives without having to write 100 emails or sitting in front of Skype... that's also quite convenient ;-). Fair enough - and what are you going to post then? We would be happy if you followed our adventures in the future and spread the word of the story we tell!